Have you heard about the new Silverado 1500 and are interested in learning more about its capabilities and features? 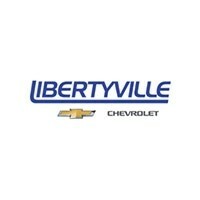 Libertyville Chevrolet has the details you’re looking for. 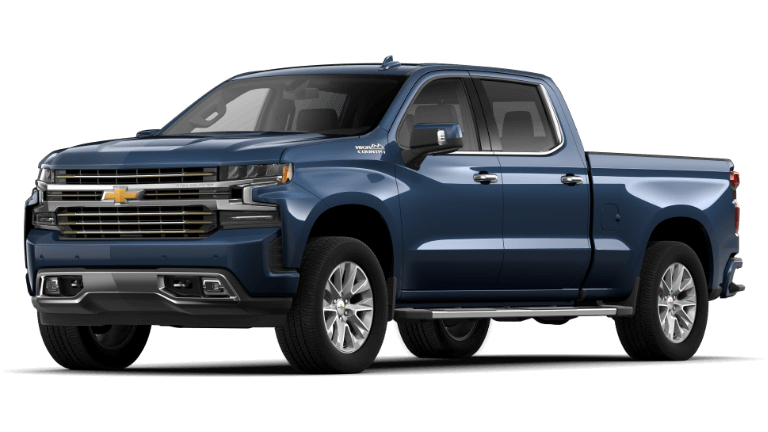 We’ve put together a comprehensive comparison of the all-new 2019 Chevy Silverado 1500 trim packages for your research purposes. Should you have any questions along the way, contact our Chevy dealership in Libertyville, IL by sending a message or calling (847) 892-1530. This base level trim offers a plethora of excellent features, all at a fantastic price point. 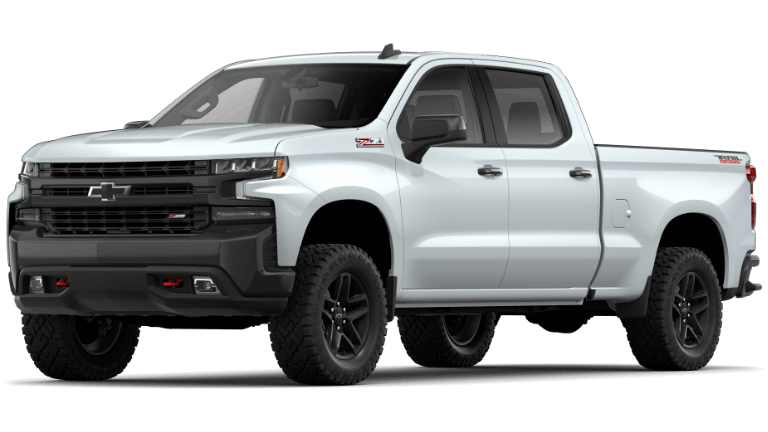 The 2019 Silverado 1500 Custom Trail Boss has the same features as the Custom trim, but adds on off-roading capabilities and features for endless adventures. If you love features on the Silverado 1500 LT, but also enjoy trail-riding, choose the off-road ready Chevy Silverado 1500 LT Trail Boss. Take the new Silverado 1500 for a spin at our Chevy dealership in Libertyville, IL today! Set up your test drive at your earliest convenience. 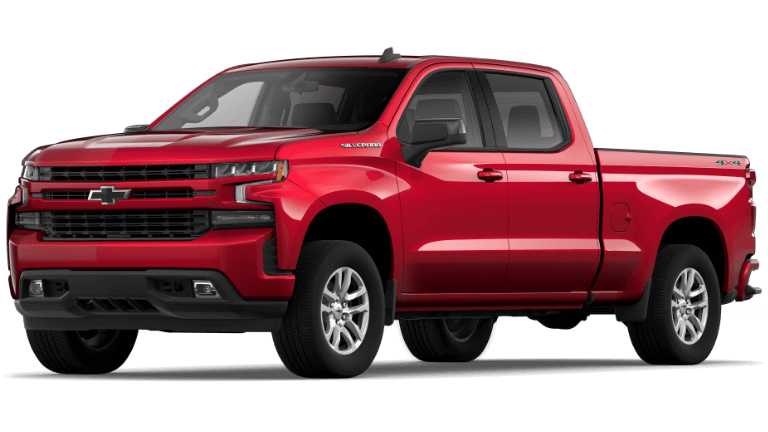 We recommend you browse the Libertyville Chevrolet new vehicle inventory for available Silverado 1500 models and trims beforehand, and check out current incentives for a great deal on this unparalleled pickup truck. Pricing includes all available rebates, dealer is not responsible for any pricing errors. Please call for pricing and availability. 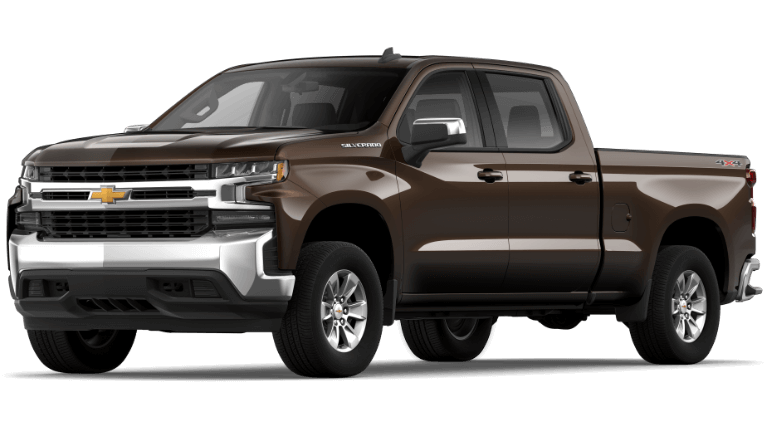 Steel Metallic 2019 Chevrolet Silverado 1500 LT 4WD 8-Speed Automatic EcoTec3 5.3L V8 10-Way Power Driver Seat w/Lumbar, 12-Volt Rear Auxiliary Power Outlet, 2 USB Ports (First Row), 4.2" Diagonal Color Display Driver Info Center, 40/20/40 Front Split Bench Seat w/Lumbar, 4-Way Manual Driver Seat Adjuster, All-Star Edition, Bed Protection Package, Bluetooth® For Phone, Chevrolet Connected Access, Chevrolet w/4G LTE, Chevytec Spray-On Black Bedliner, Chrome Grille, Chrome Mirror Caps, Color-Keyed Carpeting Floor Covering, Compass, Convenience Package, Deep-Tinted Glass, Dual-Zone Automatic Climate Control, Electric Rear-Window Defogger, Electrical Lock Control Steering Column, Electronic Cruise Control, EZ Lift Power Lock & Release Tailgate, Front Frame-Mounted Black Recovery Hooks, Front Rubberized Vinyl Floor Mats, Heated Driver & Front Passenger Seats, Heated Steering Wheel, Heavy-Duty Rear Locking Differential, Hitch Guidance, Keyless Open & Start, Leather Wrapped Steering Wheel, LED Cargo Area Lighting, Locking Tailgate, Manual Tilt Wheel Steering Column, Manual Tilt/Telescoping Steering Column, OnStar & Chevrolet Connected Services Capable, Power Door Locks, Power Front Windows w/Driver Express Up/Down, Power Front Windows w/Passenger Express Down, Power Rear Windows w/Express Down, Preferred Equipment Group 1LT, Rear 60/40 Folding Bench Seat (Folds Up), Rear Dual USB Charging-Only Ports, Rear Rubberized-Vinyl Floor Mats, Rear Vision Camera, Rear Wheelhouse Liners, Remote Keyless Entry, Remote Vehicle Starter System, Single-Zone Manual/Semi-Automatic Air Conditioning, Steering Wheel Audio Controls, Theft Deterrent System (Unauthorized Entry), Trailering Package, Urethane Steering Wheel. All prices include all available Incentives. Price is valid for 24 hours. Tax, title, license, doc fee extra. While we try to ensure online merchandising accuracy;dealer not responsible for website errors. Please call to verify price. Pricing includes all available rebates, dealer is not responsible for any pricing errors. Please call for pricing and availability. 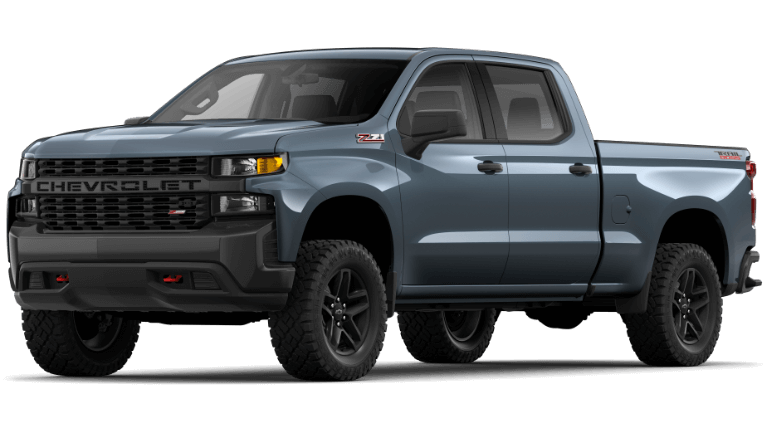 Steel Metallic 2019 Chevrolet Silverado 1500 LT 4WD 8-Speed Automatic EcoTec3 5.3L V8 10-Way Power Driver Seat w/Lumbar, 12-Volt Rear Auxiliary Power Outlet, 2 USB Ports (First Row), 4.2" Diagonal Color Display Driver Info Center, 40/20/40 Front Split Bench Seat w/Lumbar, 4-Way Manual Driver Seat Adjuster, All-Star Edition, Bed Protection Package, Bluetooth® For Phone, Chevrolet Connected Access, Chevrolet w/4G LTE, Chevytec Spray-On Black Bedliner, Chrome Grille, Chrome Mirror Caps, Color-Keyed Carpeting Floor Covering, Compass, Convenience Package, Deep-Tinted Glass, Dual Exhaust w/Polished Outlets, Dual-Zone Automatic Climate Control, Electric Rear-Window Defogger, Electrical Lock Control Steering Column, Electronic Cruise Control, EZ Lift Power Lock & Release Tailgate, Front Frame-Mounted Black Recovery Hooks, Front Rubberized Vinyl Floor Mats, Heated Driver & Front Passenger Seats, Heated Steering Wheel, Heavy-Duty Rear Locking Differential, High Capacity Air Filter, Hill Descent Control, Hitch Guidance, Keyless Open & Start, Leather Wrapped Steering Wheel, LED Cargo Area Lighting, Locking Tailgate, Manual Tilt Wheel Steering Column, Manual Tilt/Telescoping Steering Column, Off-Road Suspension, OnStar & Chevrolet Connected Services Capable, Power Door Locks, Power Front Windows w/Driver Express Up/Down, Power Front Windows w/Passenger Express Down, Power Rear Windows w/Express Down, Preferred Equipment Group 1LT, Rear 60/40 Folding Bench Seat (Folds Up), Rear Dual USB Charging-Only Ports, Rear Rubberized-Vinyl Floor Mats, Rear Vision Camera, Rear Wheelhouse Liners, Remote Keyless Entry, Remote Vehicle Starter System, Single-Zone Manual/Semi-Automatic Air Conditioning, Steering Wheel Audio Controls, Theft Deterrent System (Unauthorized Entry), Trailering Package, Urethane Steering Wheel, Z71 Off-Road Package. All prices include all available Incentives. Price is valid for 24 hours. Tax, title, license, doc fee extra. While we try to ensure online merchandising accuracy;dealer not responsible for website errors. Please call to verify price. Recent Arrival! Pricing includes all available rebates, dealer is not responsible for any pricing errors. Please call for pricing and availability. 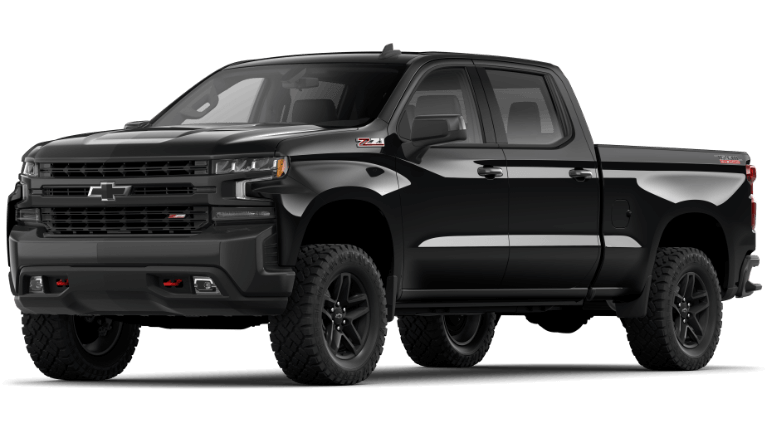 Black 2019 Chevrolet Silverado 1500 LT 4WD 8-Speed Automatic EcoTec3 5.3L V8 10-Way Power Driver Seat w/Lumbar, 12-Volt Rear Auxiliary Power Outlet, 2 USB Ports (First Row), 4.2" Diagonal Color Display Driver Info Center, 40/20/40 Front Split Bench Seat w/Lumbar, 4-Way Manual Driver Seat Adjuster, All-Star Edition, Bed Protection Package, Bluetooth® For Phone, Chevrolet Connected Access, Chevrolet w/4G LTE, Chevytec Spray-On Black Bedliner, Chrome Grille, Chrome Mirror Caps, Color-Keyed Carpeting Floor Covering, Compass, Convenience Package, Deep-Tinted Glass, Dual-Zone Automatic Climate Control, Electric Rear-Window Defogger, Electrical Lock Control Steering Column, Electronic Cruise Control, EZ Lift Power Lock & Release Tailgate, Front Frame-Mounted Black Recovery Hooks, Front Rubberized Vinyl Floor Mats, Heated Driver & Front Passenger Seats, Heated Steering Wheel, Heavy-Duty Rear Locking Differential, Hitch Guidance, Keyless Open & Start, Leather Wrapped Steering Wheel, LED Cargo Area Lighting, Locking Tailgate, Manual Tilt Wheel Steering Column, Manual Tilt/Telescoping Steering Column, OnStar & Chevrolet Connected Services Capable, Power Door Locks, Power Front Windows w/Driver Express Up/Down, Power Front Windows w/Passenger Express Down, Power Rear Windows w/Express Down, Preferred Equipment Group 1LT, Rear 60/40 Folding Bench Seat (Folds Up), Rear Dual USB Charging-Only Ports, Rear Rubberized-Vinyl Floor Mats, Rear Vision Camera, Rear Wheelhouse Liners, Remote Keyless Entry, Remote Vehicle Starter System, Single-Zone Manual/Semi-Automatic Air Conditioning, Steering Wheel Audio Controls, Theft Deterrent System (Unauthorized Entry), Trailering Package, Urethane Steering Wheel. All prices include all available Incentives. Price is valid for 24 hours. Tax, title, license, doc fee extra. While we try to ensure online merchandising accuracy;dealer not responsible for website errors. Please call to verify price. Pricing includes all available rebates, dealer is not responsible for any pricing errors. Please call for pricing and availability. 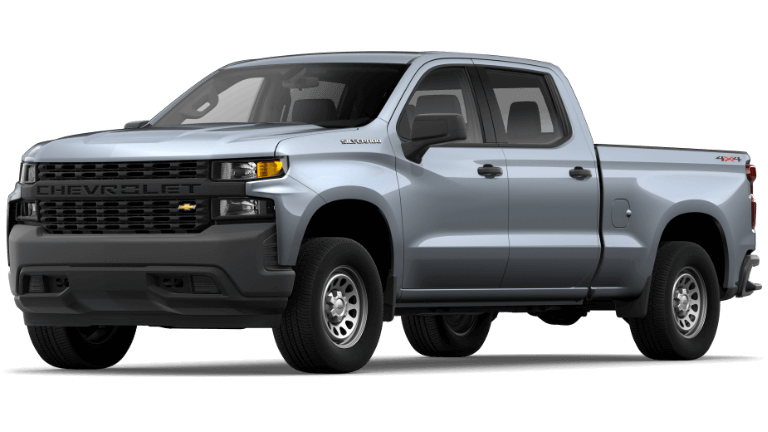 Silver Ice Metallic 2019 Chevrolet Silverado 1500 LT 4WD 8-Speed Automatic EcoTec3 5.3L V8 All prices include all available Incentives. Price is valid for 24 hours. Tax, title, license, doc fee extra. While we try to ensure online merchandising accuracy;dealer not responsible for website errors. Please call to verify price. Pricing includes all available rebates, dealer is not responsible for any pricing errors. Please call for pricing and availability. 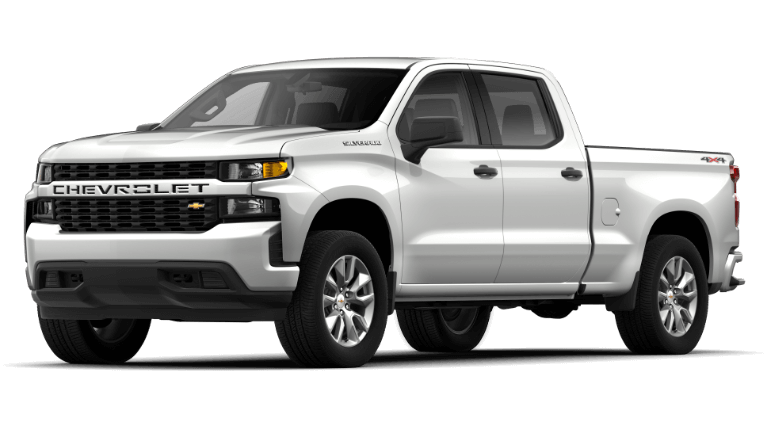 Summit White 2019 Chevrolet Silverado 1500 LT 4WD 8-Speed Automatic EcoTec3 5.3L V8 All prices include all available Incentives. Price is valid for 24 hours. Tax, title, license, doc fee extra. While we try to ensure online merchandising accuracy;dealer not responsible for website errors. Please call to verify price. Pricing includes all available rebates, dealer is not responsible for any pricing errors. Please call for pricing and availability. Red Tintcoat 2019 Chevrolet Silverado 1500 LTZ 4WD 8-Speed Automatic EcoTec3 5.3L V8 10-Way Power Driver Seat w/Lumbar, 10-Way Power Passenger Seat Adjuster w/Lumbar, 120-Volt Bed Mounted Power Outlet, 120-Volt Instrument Panel Power Outlet, 12-Volt Rear Auxiliary Power Outlet, 170 Amp Alternator, 2 USB Ports (First Row), 2nd Row Heated Outboard Seats, 4.2" Diagonal Color Display Driver Info Center, 6-Speaker Audio System, Advanced Trailering System, Auto-Dimming Inside Rear-View Mirror, Auxiliary External Transmission Oil Cooler, Bluetooth® For Phone, Chevrolet Connected Access, Chevrolet w/4G LTE, Chrome Grille, Chrome Mirror Caps, Color-Keyed Carpeting Floor Covering, Compass, Deep-Tinted Glass, Driver Memory, Electric Rear-Window Defogger, Electrical Lock Control Steering Column, Electronic Cruise Control, EZ Lift Power Lock & Release Tailgate, Floor Mounted Console, Front Bucket Seats, Front Frame-Mounted Black Recovery Hooks, Front LED Fog Lamps, Front Rubberized Vinyl Floor Mats, HD Radio, HD Rear Vision Camera, Heated Driver & Front Passenger Seats, Heated Steering Wheel, Heavy-Duty Rear Locking Differential, Hitch Guidance, Hitch Guidance w/Hitch View, Integrated Trailer Brake Controller, Keyless Open & Start, Lane Change Alert w/Side Blind Zone Alert, Leather Wrapped Steering Wheel, LED Cargo Area Lighting, LTZ Convenience Package, LTZ Convenience Package II, LTZ Plus Package, Manual Tilt/Telescoping Steering Column, OnStar & Chevrolet Connected Services Capable, Outside Heated Power-Adjustable Mirrors, Perimeter Lighting, Power Door Locks, Power Front Passenger Windows w/Express Up/Down, Power Front Windows w/Driver Express Up/Down, Power Rear Windows w/Express Down, Power Sliding Rear Window w/Rear Defogger, Power Tailgate, Preferred Equipment Group 1LZ, Premium Bose 7-Speaker Sound System, Radio: Chevrolet Infotainment 3 Premium System, Rear Cross Traffic Alert, Rear Dual USB Charging-Only Ports, Rear Rubberized-Vinyl Floor Mats, Rear Seat Leather Appointed Trim w/Storage Package, Rear Wheelhouse Liners, Remote Vehicle Starter System, Safety Package, SiriusXM Radio, Steering Wheel Audio Controls, Theft Deterrent System (Unauthorized Entry), Trailer Tire Pressure Monitor System, Trailering Package, Ultrasonic Front & Rear Park Assist, Universal Home Remote, Ventilated Driver & Front Passenger Seats, Wireless Charging. All prices include all available Incentives. Price is valid for 24 hours. Tax, title, license, doc fee extra. While we try to ensure online merchandising accuracy;dealer not responsible for website errors. Please call to verify price. Pricing includes all available rebates, dealer is not responsible for any pricing errors. Please call for pricing and availability. Pearl 2019 Chevrolet Silverado 1500 High Country 4WD 8-Speed Automatic EcoTec3 5.3L V8 10-Way Power Driver Seat w/Lumbar, 10-Way Power Passenger Seat Adjuster w/Lumbar, 120-Volt Bed Mounted Power Outlet, 120-Volt Instrument Panel Power Outlet, 12-Volt Rear Auxiliary Power Outlet, 170 Amp Alternator, 2nd Row Heated Outboard Seats, 8" Driver Information Center, Advanced Trailering System, All-Weather Floor Liner (LPO), Auto-Dimming Inside Rear-View Mirror, Auxiliary External Transmission Oil Cooler, Bluetooth® For Phone, Chevrolet Connected Access, Chevrolet w/4G LTE, Chevytec Spray-On Black Bedliner, Chrome Assist Steps, Chrome Grille, Chrome Recovery Hooks, Color-Keyed Carpeting Floor Covering, Compass, Deep-Tinted Glass, Driver Memory, Dual Exhaust w/Polished Outlets, Electric Rear-Window Defogger, Electrical Lock Control Steering Column, Electronic Cruise Control, Floor Mounted Console, Following Distance Indicator, Forward Collision Alert, Front Carpeted Floor Mats, Front LED Fog Lamps, Front Pedestrian Braking, HD Radio, HD Rear Vision Camera, Heated Driver & Front Passenger Seats, Heated Steering Wheel, Heavy-Duty Rear Locking Differential, High Country Deluxe, Hitch Guidance, Hitch Guidance w/Hitch View, Integrated Trailer Brake Controller, IntelliBeam Automatic High Beam On/Off, Keyless Open & Start, Lane Change Alert w/Side Blind Zone Alert, Lane Keep Assist w/Lane Departure Warning, Leather Wrapped Steering Wheel, LED Cargo Area Lighting, Low Speed Forward Automatic Braking, Manual Tilt/Telescoping Steering Column, Navigation System, OnStar & Chevrolet Connected Services Capable, Outside Heated Power-Adjustable Mirrors, Painted Mirror Caps, Power Door Locks, Power Front Passenger Windows w/Express Up/Down, Power Front Windows w/Driver Express Up/Down, Power Rear Windows w/Express Down, Power Sliding Rear Window w/Rear Defogger, Power Sunroof, Preferred Equipment Group 3LZ, Rear Carpeted Floor Mats, Rear Cross Traffic Alert, Rear Dual USB Charging-Only Ports, Rear Seat Leather Appointed Trim w/Storage Package, Rear Wheelhouse Liners, Remote Vehicle Starter System, Safety Alert Seat, Safety Package II, SiriusXM Radio, Steering Wheel Audio Controls, Theft Deterrent System (Unauthorized Entry), Trailer Tire Pressure Monitor System, Trailering Package, Ultrasonic Front & Rear Park Assist, Universal Home Remote, Ventilated Driver & Front Passenger Seats, Wireless Charging. All prices include all available Incentives. Price is valid for 24 hours. Tax, title, license, doc fee extra. While we try to ensure online merchandising accuracy;dealer not responsible for website errors. Please call to verify price. Pricing includes all available rebates, dealer is not responsible for any pricing errors. Please call for pricing and availability. New vehicle pricing includes all offers and incentives available to all. Prices are valid for 24 hours. Prices are plus tax, title, lic & $179.81 doc fee. While great effort is made to ensure the accuracy of the information on this site, errors do occur so please verify information with a customer service rep. This is easily done by calling us at (847) 892-1530 or by visiting us at the dealership. ***Selecting 0% offers may be in lieu of incentives. Contact dealer for details.